Before you market, you need to set your retail price and make S&H decisions - click here for more information and suggestions. There are several different things you can do to help sell your book/periodical. Below are several sales strategies that you can use for any type of book/periodical. Sound marketing strategies work for any subject, format, or genera - fiction or non-fiction. While Gregath has made it's name with genealogy and history, these are valid promotional tips and ideas for any project. Make a marketing plan and follow through - but remember plans can be changed or modified as you discover what works (and doesn't) for each book. The best plan won't realize any sales if it is not implemented. Consider including in your plan forward action of some type every week (or every day). Remember - every decision you make about your book, from outline and font choice, to binding type, website, retail and traditional "marketing" all impact books sales and how you will "market" the work. Consider your "brand" combines visual, vocal and social elements for both your book(s) and the author. Click here for information on specific advertising tools and services. Don't pick just one thing to promote/market your book with: Omni-channel marketing has proven the best way to get your information to more people. From mailing to social media, etc. the more ways you promote your book, the more ways your potential readers will learn about you. When marketing a book, try to keep all of your author produced material to a general visual theme concerning format. This might include choosing a paper/card stock/wallpaper or background color, keeping the major amount of your fonts the same (many even make sure it matches the book). You may even choose a "theme" (ready made design - often involving graphics) from a website, word processor and/or publishing program and carry it from the manuscript across all types of media (multichannel). Like any large retailer, this "small stuff" will help build what is called Name Brand Recognition. When they see the envelope or postcard in the mail, glance at an advertisement or preview an email, they know without even examining it - it's from you or about a particular book. If they see a poster or flyer they know it's about the book without reading it. Many "repeat authors" even carry the first book design marketing format over to other projects. Some keep the exact same design format, others change one or two elements such as color or headline font. Even in today’s world, print has still proven the most effective channel for sales – even when promoting electronic editions. Free PR promotion in publications (newspapers, newsletters, bulletins, circulars, boutique papers and magazines) may need follow up – the days of “if you write it they will print it” are, for the most part, long gone. In addition to brainstorming what publications to send them (alumni, your hometown, subject town[s], industry specific, church, organization, or other special interest), be sure to include all contact information (including electronic) in your "cover letter". bonus information included that is not "in print" - CD with content, link to private website/repository, Augmented Reality (AR) such as QR Codes, etc. These are all selling points. Don't overlook something that is positive because it wasn't the main publishing focus. For instance, archival quality (permanent paper) is a much talked about and sought after element in reference book publishing. Even if this was not a high priority for the author personally, it may contribute to sales - but only if it is publicized. Get the word out...Basic, low cost, options to include in your publishing plan that will let people know the book is available include formal copyright registration, obtaining a Library of Congress number, and getting an ISBN. These are more things that are sometimes overlooked, or even considered unnecessary in genealogy. Please remember that marketing (in any form or format) is an ongoing effort. Never look at a strategy as "one and done". It should continue and plans evolve - unless you have sold out of a planned, definitive edition and have no plans of ever again republishing. As family historians, most authors have a list of public (or private) repositories that they would like to see their work preserved in. Many times this list equals or dwarfs the list of "paying customers". Many times budget will impact how many courtesy copies may even be produced: Consider soliciting sponsored copies. With POD, there is no reason a special "donated by" page can not be included directly into the book binding. A more traditional route would be with personalized donation book plates. Further incentives, beyond the good preservation work, might include a gift, digital copies of source material, special access to your archives, etc. While the urge to be polite and couch all marketing requests in neutral language is strong in older people, however today’s marketing strategies may require a bit more: Calls to action are common. That said, balance is good - consider producing a mix of material from “hard sell” to neutral information in your ongoing marketing interaction. You don’t want 100% blunt promotion in all your communication. In the 21st century, avoid using much passive language in promotion as it may encourage potential buyers to set the information aside to deal with later. Save neutral and passive voice for longer format informational pieces such as your manuscript instead of ads, bullets/blurbs, or customer service. Paid Advertising: If you have other suggestions, please feel free to contact us. Display advertising can work to ones advantage. National advertising can be well worth the effort and cost. 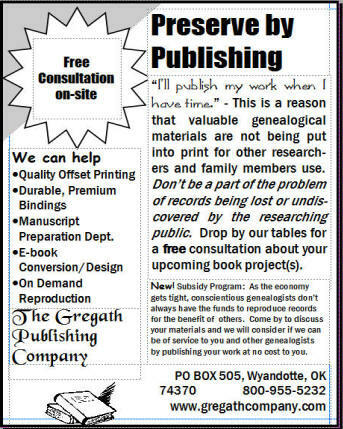 A one column, one inch long display advertisement in a genealogical magazine that is circulated nationally or internationally will usually bring a good response. Depending on your target audience, display advertisement has been known to bring more interest than the same information placed in the classifieds or even marketplaces. Advertising rates are usually published in each issue and can vary greatly from publication to publication. The same advertisement may be placed in target newspapers, topical (genealogy, Civil War, hobby, geographically targeted, etc.) magazines and more. When the book is completed, advertisements which state the total number of pages and an increase over the pre-publication price should be placed in target media. Price setting is entirely up to the writer and may be noted in later advertisements. Some newspapers may still have “personal” columns which are usually widely read. Sunday editions are the most popular. They are usually sold on a “per word” basis and are more reasonable than the display type advertising. Depending on the type of book you publish, this can be an effective avenue. Low cost/no cost suggestions on how to keep subscribers to periodicals. If you have no budget restrictions - hire professionals to cover your every need and desire. Mailing: If you have other suggestions, please feel free to contact us. See also business mail discounts and EDDM. Sales letters (and/or flyers, brochures, sell sheets, tear sheets) and postal cards can be an important part of the advertising campaign. Tear sheets work best as part of a mailing, not the only element. 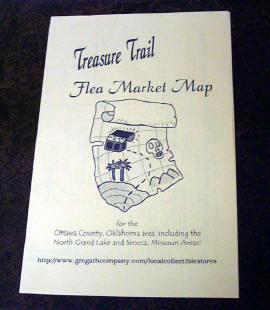 We now offer limited free tear sheets on request to aid you in marketing. Additionally we now offer Specialty Items (apparel, 4-color work, etc.) online ordering to aid in your marketing plan. Perhaps important data from some of these persons will be included in the manuscript and they will be a potential buyer. A mailing list may be prepared in many ways and the writer must choose a method most efficient for his sales campaign. Some authors prefer to hand address each mailing. However, a proven time saving method is the use of pre-addressed self-adhesive labels, either copied or computer generated. The sales letter, flyer/brochure, or postal card is usually the prime source of sales for genealogical and historical books. Several sales tools may be used in the sales campaign. The authors choice as to exactly which tool(s) to use will be influenced by many things such as postage, design expertise, any printer/publisher assistance, and personal preference, just to name a few. Write your sales tool to fit your needs. You may try several before you feel you have written and/or designed the perfect one(s). The sales postal card may have a unique place in your sales campaign. It is the least costly of all your sale efforts. It is also the hardest to write because of its size. Write whatever it is you wish to advertise. Then, edit down the material to the size of a postal card. Library and society sales require special attention and consideration. When libraries and societies purchase the book, it eventually becomes available to many interested persons and may increase sales. 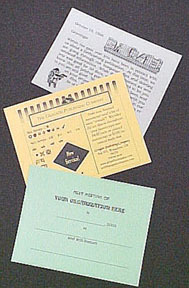 Most libraries and societies order with a request for two copies of the invoice. Payment may be delayed several weeks due to necessary processing required by most tax supported and non-taxed organizations. If you are planning a softbound book, check to see if your publisher can produce a few hardbound copies. Then offer this option as a "special order" feature to libraries. Many will prefer to spend more on a hardbound book then have to get it hardbound once it has been purchased. You may choose to have matching stationery - including cards, invoices, inserts, etc. This provides you and your project(s) visibility and product recognition. If you incorporate your project(s) into your stationery and add a card or bookmark to all correspondence, you never know what interest you may pick up. If your promotional mailing is in excess of 200 pieces of the same design, sent at the same time to domestic addresses, you may wish to economize with a business (bulk) mailing via marketing permit imprint. Clients that publish with us can take advantage of an established permit imprint to send their promotional materials out by standard mail - many times at a postage savings over self-mailing. If the mailing is large enough, first class mail is also an option at permit discount. Gregath can also easily use client's permit, though not automation, at this time. Never assume anyone or anything (web “robot”, interest group, non-profit, etc.) will do anything for you – always ask. This includes asking people share your information, please post, and seeking out search engine (and other) submission opportunities for your web presence, etc. More Ideas click here for free/inexpensive: If you have other suggestions, please feel free to contact us. Develop a "hot new commodity" - the book trailer. These can be included in media kits and on websites, social networks, and blogs. View examples at www.previewthebook.com, www.watchthebook.com, and www.youtube.com. Many trailers can be found at major bookstore sites as well. Branch out in your PR efforts! Case study (Carrie Cook, VP/Webmaster Gregath Publishing): In the summer of 2007 I attended Conestoga (Oklahoma's largest SF&F Literary convention - www.sftulsa.org/currently no longer an annual event). This was a vacation: reading science fiction and fantasy was enjoyable and several favorite authors would be there. This was not considered a "professional" event, but a fan convention. For the "gate fee" (2007 membership), they had a full writer's workshop, as well as classes on marketing, cover art, e-publishing, as well as lots of other fun stuff. The weekend was enjoyed and attendees petted the wild animals (2007 convention charity), met authors, editors, and other publishers, as well as doing the "fan thing". After all of the positive vibes soaked up over the weekend many authors came home ready to try lots of new things, including maybe even writing in this genera for periodicals - yes, they pay as well! Correctly applied for and used Copyright (http://www.copyright.gov) and Library of Congress (http://www.loc.gov) Card Catalog Number. A correctly applied for and used ISBN can lead to more sales and easier distribution. 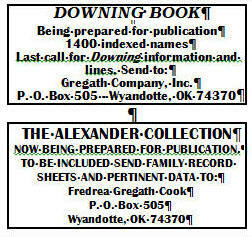 Having an ISBN adds your book to the "Books in Print" series. Most major online booksellers use this as their database. This is also how most bookstores check on availability for special orders. A newsletter (or blog) specifically geared to your project may receive a wider audience than you think. Keep folks up to date on the preparation, share funny stories, additional material that may not make it into the finished book, photos, documents, etc. A current best-selling author that used to ask for SASE's and only printed the number she needed each issue (the time period is up to you) - her fan club now distributes for her by mail and email group. Doing this by email, newsgroup, or email list is less expensive than traditional mail. Specialty Items (apparel, mouse pads, etc.) can be used to network. Either as "give away" or as items you use/wear while promoting your book. We also provide T-Shirt services! Any travel in the pursuit of research, family reunions or gatherings, visits from persons pertaining to research or writing, etc. Start with any gatherings your normal business brings you to. Examples include scheduled civic club meetings, family and historical club meetings, reunions, etc. Make sure that everyone knows about your upcoming book project. Don't discount "hand selling" books through online services. Do you eBay, or use other auction sites? Don't want to "risk" listing fees? Monitor sites you use for specials. Have sales information ready for those "free" times to take advantage. Even if a copy doesn't sale ASAP, it may get further out into the traffic stream and you may pick up sales down the road. Though it is contrary to traditional logic, consider getting your books in libraries! The benefits can be many: your goal is any sale and a library is as good a place as any; getting your book out for "taste testing" - all contact and ordering information bound right in the book; building buzz and networking; reviews; Worldcat listing; Library of Congress number, goodwill for donations; making it easier to research, etc. Though it isn't geared toward genealogy and history, visit this interview for further insight. One might consider some paid services. No one needs to spend hundreds of dollars on an internet marketing package - unless results are guaranteed. Some charge a periodic (monthly, etc.) fee, such as Home Grown Books. The benefit of others helping market your book may well be worth the minimal fees. Others may offer no cost listings but take a percentage of any sales, such as our advertising programs. Consider putting together a press/media kit. These can be sent to all media outlets (as is, or modified for each), as part of a proposal to book stores, to those you are approaching for a book-related event, to bulk sale targets (such as a school system for children's books), etc. Don't prepare a single press kit and reproduce it faithfully throughout your book promotion. If you get bad reaction to something, drop it or update it. If you keep getting the same questions, try to address them in future kits. In the 21st Century, we are becoming accustomed to personalized marketing materials and you should consider personalized targeting when possible. Supportive Material: excerpt, table of contents, etc. Related Marketing Items: bookmark, postcard, pencils, notepads, chocolates, stickers, etc. If you know of a targeted search engine (or listing) that takes address submissions (such as www.cyndislist.com for genealogy listing), be sure to submit. Place your address on all correspondence, PR material, business cards, email signatures, etc. Post your address on related bulletin boards (online or off), egroups, blogs, etc. Do press releases about your site launch, new material available, etc. After that, devote as much or as little time as you wish. The determined visitor will find you if you've done your basics. For more in depth work, SEO companies are willing to do this work for you. For search engine submission, look for links on your favorite search engines and/or run “search submission” or similar searches for lots of places to start. Note even direct search engine submission is not instant – it can still take weeks, so don’t put it off in your marketing plan. Several methods of advertising have been discussed here. To recap, magazines and newspapers, paid display and classified advertising; magazine and newspaper coverage, non-paid newspaper personal columns, news releases, letters to specific columns and editors; Postal Sales Tools, postal cards, flyers/sell sheets, tear sheets, letters, brochures, etc., have been mentioned. The writer must choose his advertising campaign(s) wisely. The author must select the type of advertising, which will net the most sales for the least amount of expense. A well planned sales campaign must be flexible to the extent that if one method of advertising is not successful, there are finances available for another method to be attempted. If advertising placement is well selected, the results in sales should outweigh the cost. G550-$20.00 WRITING Family History Or Genealogy For Pleasure and Profit Complete Edition, by Gregath Company, Inc., 2015. ISBN: 0-944619-00-2, 8½x11", softbound book, 150 pages, suggestions & examples of all facets of your project for the typist and/or computer user. Also available on disk. Note: All G prefix books 100 pages or more, this one included, that are SB can be special ordered in hard cover edition - contact for details.